Learn Boxing... Ever wondered how to box? Well Light-Heavyweight Pro Boxer John Scully has put together this insight into the pro boxing game and useful tips on how to Box for Saddo's Boxing Site. As someone who has been boxing since the very early part of the 1980's I like to believe that I have picked up some knowledge a long the way. I often get e-mails from kids and adults alike who are interested in learning to box or how to exercise or what to do for running. etc. 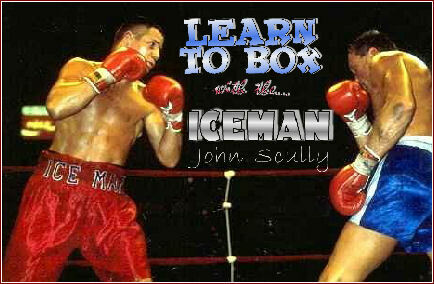 So with that in mind I have decided to include a brief training manual for those of you out there that have an interest in boxing and do not mind getting the opinions and insights from the viewpoint of just one of many, many people that have been in the game for a long time. Everybody has their own thoughts, ideas and ideologies on the boxing game. Here are some of mine. being able to dribble. What good is having a great jump shot or being able to slam dunk if you can't dribble? It's like trying to build a house and you try to construct the attic first. You have to start from the ground and work your way up. The jab is starting at the ground and you can't complete yourself as a boxer (your house) without building a good and solid jab first. Muhammad Ali used to win a high majority of rounds in fights by using the jab as his primary weapon. IF there is one punch that a boxer could win a fight with by using that punch alone, it is the jab. When using the jab, the boxer needs to have his knees bent and chin down. The jab must come directly from the "ready position." Make sure you twist your arm in a corkscrew like motion just before impact. That is what will give you the SNAP you will need for a good punch. That is what will make your opponents head snap back when you land it properly. Try it with the "twist" and without and you will FEEL the difference. Try and feel your shoulder being thrust into the punch. Imagine a towel when you were a kid at the pool and you used to "whip it" at your friends! The jab is just like that towel you left welts on your friends with. Of the modern day boxers I think that Winky Wright has what might be the jab that is hardest to defend against. Very quick,straight and precise. I also trained "Bad" Chad Dawson for a while as a pro and I think if you watch his right jab (he's a southpaw) closely you will see my influence there. I worked long and hard with him on getting the proper snap and range with it and I believe he has developed it into one of the better jabs out there in the game today. If you are a heavyweight then look no further than old videos of Larry Holmes to see how it looks when it is thrown with a big man's form, power and accuracy. hooks, but the short, fast and direct hook that Trinidad throws unquestionably gets the most effective results. In my opinion, the best time to throw the hook is when it follows your right cross (as in the traditional combination of jab, right hand, left hook). Throwing the right hand will and SHOULD put you in perfect position to let the left hook go. You want to turn your body in a snapping motion. Think of your left hook (or right hook if you are a southpaw) as a piston in an engine. You want it to snap out in that manner. In terms of the left hook to the body think of Micky Ward and his famous double hook (my favorite combination. Hook to the head first and then down to the body). Bend your knees when you want to really dig a body shot. Bend your knees and get down low enough so that you are almost looking right at the part of the body that you want to hit. Roll up with your punches. Picture the angle that it would take to push a mans bottom rib, down by his waist, up towards his throat. Roll up into the lower rib cage with that in mind. For the record, I would say that two of the most vicious -and yet underrated body punchers of all time are both Sugar Ray Leonard and Tommy Hearns. Watch them both to see vicious, two handed body work. right by your chin where your right hand should be when you are in your "ready stance." It should be thrown directly from your face to your opponents face. The quickest and most direct way to get from one point to the next is in a straight line. I try to imagine that when I throw my jab, that my jab has traveled down a corridor. When you bring your jab back and let the right hand go it should travel down that very same "corridor." I think Tommy "The Hitman" Hearns is a very good example of someone who throws a very well executed right hand. Another GREAT example of how to throw came when Foreman hit Moorer with the right hand off the jab. Watch Foreman hit Moorer and you will see a PERFECT right hand. uppercuts so, because of that, most fighters do not practice avoiding them very often. The punch is good when thrown at a variety of times, but I think after throwing a good left jab it is good to follow up with the right uppercut. The uppercut should usually be thrown during the course of "inside fighting" when you are close to your opponent. Throwing the uppercut from too far away leaves you in a position to be countered much more easily. Buster Douglas made that mistake against Holyfield. On the other hand, J.C. Chavez had a wicked inside uppercut. He tore Meldrick Taylor up on the inside with it in their 1990 fight. Throwing the left jab sets up the uppercut very well. You should throw the uppercut in a way that allows you, upon completion of the punch, to be in a position to follow with a left hook afterwards. Mike Tyson is also someone, among others, that has a very effective uppercut. COMBINATIONS : My own personal theory of combination punching is this - A Boxer should be able to , theoretically, throw a thousand punches in succession without losing balance. The reason being is that every single punch in a Boxers arsenal , when thrown properly, should leave the Boxer in a position where he can and will be able to throw another punch. For example, when you throw a left jab you should automatically be in a position to throw a straight right. When you finish with the right hand, you be in a position to throw a left hook, etc etc. If you throw a right hand, or any other punch , and you are off balance and NOT in a position to throw another punch afterwards and you find that you have to re-plant your foot to throw another punch then you DID NOT throw that punch properly. Roy Jones, Shane Mosley and Floyd Mayweather are three Boxers that have the ability to throw very good Combinations. TO SUM UP 'PUNCHING': The game of boxing requires that you be able to move well, slip punches, keep your hands up, be tough, etc., BUT the main thing, above all else, to win a fight you must THROW PUNCHES. In my opinion you should start by learning how to throw the left jab (or right jab if you are a southpaw). It is human nature to want to get started by throwing hooks and crosses and other "big punches," but if you are serious about becoming a "real boxer" and want to develop real skills that will maybe take you to a higher level, then you MUST concentrate on perfecting your left jab first. Even if it takes you MONTHS to do, you must have your coaches work with you on your jab until you can win rounds with ONLY that punch if need be. BREATHING : The MAIN THING to remember when you are boxing is to breathe through your NOSE and not your mouth. When you open your mouth too much and try to breathe like that, it leaves you more susceptible to having your jaw injured. Be relaxed in there and you will not get as tired as you will if you are tight and nervous. CIRCLING YOUR OPPONENT : In my opinion, a Boxer must be able to ' Box' and ' Fight'. If an opponent wants to be ' rough' with you, then you need to be able to 'box' so that you can neutralize his offense. If he wants to Box you, then you need to have the aggression and the skills to take him out of his Boxing mode. You should never stand directly in front of your opponent for more than a few seconds at a time. You should constantly be in a position where you can circle to the left or right every few seconds so that you do not give your opponent the chance to ' set up' . The longer you stay in one spot, the easier it is for your opponent to size you up and get off good punches on you. TRAINING : I recommend that a boxer train Monday through Friday and take it easy on the weekend. The only thing you may need to do each weekend is keep up on your push-ups, sit-ups and jogging. During the week, it is usual for boxers to be in the gym each day for about two hours. Each day of training should include stretching, exercises, shadowboxing, skipping rope, punching the heavy bag and on some days, sparring with other boxers. Each coach has his or her methods of coaching you, but ALL boxers should be in the gym as often as they can during the week. Repetition is the KEY in becoming a good fighter. All your punches and footwork, etc. must be practiced very often and with great desire to perfect them. ROADWORK: Everybody hears about fighters doing roadwork. People see a guy on the street jogging and they often assume he is a boxer. Running, roadwork, is a very important part of the boxers training but don't feel that you have to run every day. Too much running is much worse than not enough. One thing is..the DISTANCE of a run is not so important unless u are trying to JOG for distance to sweat a lot and make weight. I would rather see a guy RUN for two miles than JOG for five. Because almost ANYBODY can jog five miles, even guys that aren't really athletic. But not many guys can RUN HARD for two miles , a long sprint basically. And understand this... once you are in GREAT shape then you don't need to run so much anymore. You just need to MAINTAIN. There is a difference between GETTING in shape and STAYING In shape. A guy in AWESOME shape doesn't need to run five days a week on top of all the other things he is doing, assuming he trains real hard in the gym, eats well, etc. Three or four good days of a nice hard run, usually with some sort of HILL or mountain mixed in to one or more of the runs. Try RUNNING two miles and JOGGING five and you will see what I mean when I say there is a big difference between the two. Here is a basic hint for you to always remember: If you workout and train and you are not very tired after you get done doing your particular workouts (running, hitting the bag, hitting the mitts etc) then you just didn't work hard enough! NUTRITION: Nutrition is EXTREMELY important to a boxer. Each person differs in some cases, but I can tell you to get the most out of your conditioning it would benefit a serious boxer to avoid the following: Fried foods, butter, soda, cakes and cookies, ice cream, candy, syrups and dressings and most foods that contain a lot of fat and are high in calories. Water, even more so than gatorade, is the best fluid to take in. Steaks and chicken with the majority of the fat cut off and cooked either by broiling or baking are very good. The key is to eat enough so that you can still be strong. Even when you are trying to make weight it is VERY important to get your nutrition. Your body cannot burn fat if it doesn't have food to burn. Feeding your body is the only real way to keep your metabolism going. When all is said and done it doesn't matter how pretty your trunks look or how shiny your boxing shoes are. You don't have to have sequins and slick embroidery on your trunks. Don't pay attention to the press conferences and the news articles you read about yourself. Don't let yourself get all jazzed up about the autographs you sign or the pictures the fans want to take with you or the women that want to meet you because your the "pro boxer" now. Don't get too caught up in the hype, the promotion, having your picture on the fight poster, talking stuff at the press conference or being invited to meet people that never cared about you before you became a "somebody" or about going to eat at fancy places with your new managers that you would never eat at in a million years before you became a pro. I remember a guy I trained with for a while back in the 1990's who was steady knocking guys out on hamburgers, fruit punch and ring dings. He got picked up after a while by a manager willing to invest in him and before you know it he was introduced to "linguini with white clam sauce" and other stuff like that. Maybe as Mickey Goldmill once said it, "he got civilized." Who knows? Whatever happened, for what it's worth, it was soon after that this particular guy hit a terrible losing streak that he never recovered from. And remember: Talking a little trash here and there isn't always so bad, that's very true, because drawing attention to you and your fights is certainly one way to get your name out there, but never forget that the easiest thing in the world is to tell someone how good and tough you are while the hardest thing is actually going out and proving it. Anybody can SAY they're tough but not everybody can BE tough. Don't get lost in having fans and fan clubs, seeing your picture on a fight T-Shirt, being recognized at the mall and having people that see you at your local mini-mart telling you how "You're the MAN." And when you actually do fight, don't worry so much about having your boys from back home in your dressing room with you so they can walk you to the ring while they talk trash into the camera on behalf of you and then, when they get in the ring with you, they try to look hard and tough with their sunglasses on even though it is 9 O'clock at night and you guys are indoors, while all the while they are thinking somewhere in their minds about how cool they must look to the people in the audience or the girls back home that they hope are watching them. They look ridiculous and they make you look ridiculous, too. And if you want to appeal to people in a way that can make you a star make sure you keep your friends that never fought before, but want to come along for the ride, in check. Because when you are in the hotel the week of your fight and you are there with three four of your buddies who actually seem to think it is their job to be loud, cocky and obnoxious while looking menacing because they are with you it isn't a good reflection on you. The average boxing fan doesn't and want to approach a boxer whose friends look and act like extras from a gang movie. The term "fan friendly" doesn't just mean you, it means your team and the people you surround yourself with, too. Don't get me wrong, you can have most of those things if you really want them or feel they will help you at some point in some way. They feel good and they look good. Nice memories. Good for the ego. But, above all else, it is about the training and the fighting. Remember that much. At the heart of it all there is nothing else. Because all those things amount to nothing when the real deal moment arrives. The only thing, the one single thing to the boxer that matters most, is that you better be in better shape come fight night than you have ever been in your life because every time you walk up those steps there is going to be some guy in the other corner who doesn't care about your flash and razzmatazz, he doesn't care about your glorified amateur career and your sparkly trunks (along with the old Ali tassels) and he knows that all your tough looking friends with big mouths will be sitting safely at ringside while he tries to stomp you in a few minutes. He's mean, hungry and wants to feed his kids and the only way he can do that is to get bigger and better fights. One way for him to get those fights is by beating YOU into the ground tonight. So, you better do more sit-ups and more push-ups than the next man. Run harder and be more dedicated. And if you do choose to buy into the showy aspects of boxing, well, you had better learn to differentiate between reality and smoke and mirrors. You take guys like Sugar Ray Leonard, Sugar Ray Robinson and Muhammad Ali and for some strange reason the words "tough" don't come to mind when you think of them as easily as they do when you think of guys like Holyfield, Hagler, LaMotta and Gatti but the fact is that despite their showmanship and entourages and charisma those guys were as tough and rough and mean as any man that ever laced on gloves. You can talk about the latter guys and give examples of when they went through wars and showed big heart but you better believe that it took just as much heart for Ali to go to war in Manila with Frazier, to get up off the floor in the 15th against Frazier in 1971 and to go 12 rounds with Norton the first time with a broken jaw. How about Sugar Ray Leonard digging down as deep as anyone has ever dug when he fought back through a badly swollen eye to stop the awesome Tommy Hearns back in 81? And the Sugar man of the 40's and 50-'s was certainly one of the greatest boxing showman in history but he proved over and over that when the going got tough the Sugar Man got going. Like when he was past his prime and losing badly on points against the very awkward Randy Turpin back in the 1950's he somehow found the energy and the heart and the will to let loose with a come from behind rainfall of shots that brought his title back to him one more time. So you can be cocky and a showman and have charisma and all that but, remember, you will still have to be as mean and rough and tough in your heart as those guys were. When the going gets tough you definitely got to get going. There are also things you can't always control like who has the better jab, speed, power, combinations etc. but there are also things you can control and one of them is that you can do your best to be in better condition than everybody you fight. So put down the pepsi, the chips and the snicker bars and focus better than everybody else in your gym. And if you are one of the millions of foolish kids in this world that is drinking alcohol and smoking pot (among other things) and you are actually doing that while also attempting to be a top of the line boxer, well, why don't you just save yourself some time and quit boxing right now. Or, if you want to, just go out in your backyard and put some dirt in a cup and ingest that because it will do your body almost as much damage at a much cheaper price than you're paying now. Forget what you hear from your friends and from TV and images you see in print ads because, point blank, alcohol and drugs are poison. And also, for what it's worth, I feel that any young person that will freely allow themselves to even try alcohol and drugs in the first place probably doesn't have the character and will to get the most out of their potential anyway. I know, I know. They will point to all the pro athletes that do drink and smoke and that's true, a lot of them do and some of them still do very well for themselves actually. But here's the thing, though: They will never, ever truly know what levels and what type of longevity they could have reached had they just been strong willed enough and smart enough to refuse ingesting what every idiot in the world already knows can't possibly be good for you. While I am at it, check this out: You all have girlfriends or wives. No problem there, of course, but remember and realize this: There are very few young woman (girls) out there that really know what it is to be a fighter and to not only fight but to prepare to fight. Boxers are a special breed of people and things really need to be right well before the fight actually takes place, mentally as much or more as physically. When someone close to you can't truly understand what you are going through then they just won't know any better and, as a result, peace of mind is hard often to come by. It's a complex thing but a lot of young guys, of course, want to have a woman in their life and the younger the man the less actual commitment he might be ready for or willing to have. The problem there is that woman are the same way and when it comes down to it if you want to be the best fighter you can possibly be but you have a significant other that doesn't seem to be able to relate to your boxing career and what it would take for you to have peace of mind then, unfortunately, sometimes it is best to part ways. If you want to be the best you can be then you better believe who you surround yourself with can be a very important point. You need to have peace of mind and you need to be able to focus on the important things. This game we are in is a dangerous one, believe that, and your mind has to be right. If your other half doesn't have the wherewithal to recognize that and to give you the support needed then maybe there will and should come a time that you will have to choose. Choose wisely. Bottom line? Train not just like a BOXER, but like a pound-for-pound champion. You might not have the edge in certain areas compared to the guy you are going up against but you can definitely control who trains harder, who wants it more. Make sure it is you. Do some hard work in the gym and when you feel like you cannot push any harder? Push a little bit more than you even want to because I know guys that could probably demolish you inside of three rounds and you don't even know their names yet because they aren't famous, undefeated or promoted by a big timer. They are strong, though, and tough and skilled, too. They may never get a chance to get you if you have a good matchmaker and a promoter that is looking out for you but they are on the sidelines waiting, just waiting, in case they do in fact get the call to step in and get a hold of some kid like you who thinks he's a big shot already even though he hasn't fought anybody of consequence yet. He will not be as flashy as you and won't have very many fans at the fight to cheer him on and walk him to the ring but you better believe he's a real fighter and he's going to bring it and bring it hard. You might be very talented and you may have slick moves, some pop in your punches, good speed. Maybe you are even a wonderkid, a prodigy. Maybe they call you "The Truth" or "The Messenger" or some other catchy nickname. But nicknames don't win fights now, do they? Actually, most of the things I am talking about here don't really help you actually win fights, right? Either way, there's much more to this game than all that. You need to be focused enough and strong enough and mentally and physically resilient enough to fight as hard in the eleventh and twelfth rounds (or the third and fourth if you are an amateur) as you do in the first round when you feel great and things are all going your way. Once again, the reality is that all those extra, mostly irrelevant things are fine and will give you a nice looking scrap book someday but when it really comes down to it, though, the one and only thing that matters at the end of the day is the FIGHT. You can do without nicknames, posses, promoters, sequins, trash talking, interviews, autographs, even judges, promoters, trainers and referees for that matter because when it comes down to it, at the root of it all, the only thing that boxing truly cannot do without is the fighters and the fights.